The wonders of speech and sound, the mysteries of silence and the entanglements of love are interwoven into a deeply moving tapestry in Mark Medoff’s Children of a Lesser God. 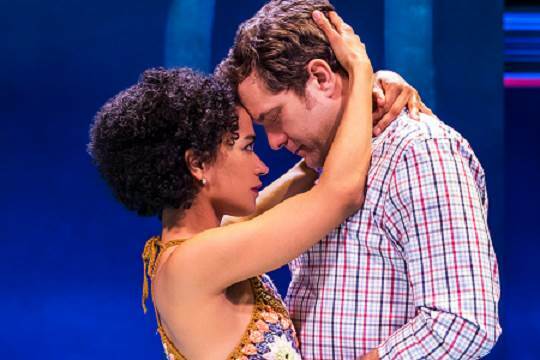 Now the drama, whose original Broadway production garnered it a Best Play Tony Award in 1980, becomes an even deeper experience in this revival, lovingly directed by Kenny Leon. The play tells of the romance between Sarah Norman, a woman completely deaf from birth, and James Leeds, a hearing speech teacher. James is newly arrived at the school for the deaf that Sarah has attended since childhood and where she now lives and works as a cleaning maid, while continuing to attend class. There is an almost immediate chemistry between them but a problem as well: Sarah’s refusal to learn speech despite James’s impassioned arguments. “I have a language that’s as good as yours,” she tells James early in their relationship, using the sign language that has become her own articulate means of communication. The barrier between them continues to grow more difficult even as they marry. There are moments of bliss, but fiercer moments of antagonism as James pushes Sarah to speech and Sarah, fearful of the distortion that speaking often engenders in the deaf, implores James to understand the comfort of her world of silence. It’s a high-stakes battlefield, and Leon in an inspired stroke of casting raises the stakes even higher. The role of Sarah -- like the play’s other roles -- is not specified as to race, but it has been played by white actresses, winning a Tony Award for the late Phyllis Frelich in the original production (Medoff wrote the role for her) and an Academy Award for Marlee Matlin, who starred in the 1986 film adaptation. 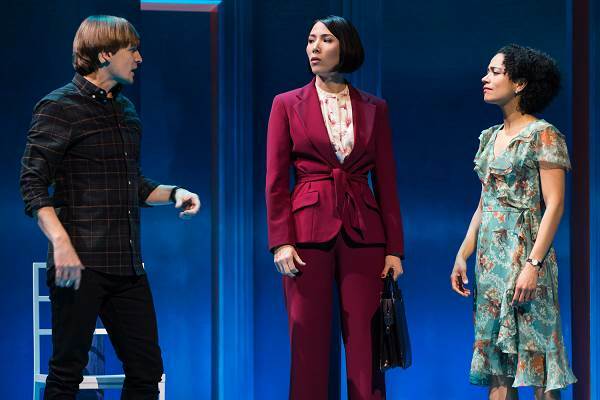 In this revival, Lauren Ridloff, an actress of African-American and Mexican descent and a former Miss Deaf America, plays Sarah in an enormously moving performance. 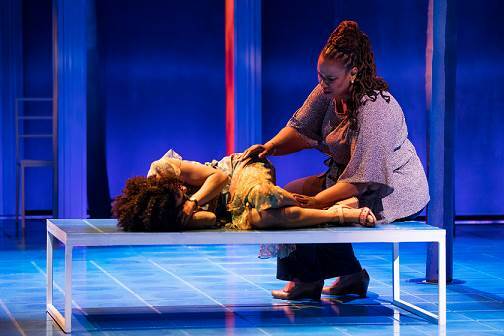 And while there is still no mention of race in the text, her persona as an African-American heightens the character’s aura of pride in difference and the play’s inference of the deep prejudices in a society that still does not fully accept physical impairment – or racial differences. To make it clear that Sarah is a black woman and Ridloff not simply a matter of non-traditional casting, he has cast another African-American actress, Kecia Lewis, as Mrs. Norman, Sarah’s estranged and flinty mother. The elevated resonance it gives the play is reflected in one particular exchange between James and Mrs. Norman. “You’re still trying to force her to speak and lip read so she can pass for hearing,” Mrs. Norman says. “No, what I’m trying to force on her is the ability to function in the same world you and I do,” James responds. “As if that were something to aspire to,” she counters curtly. It’s a line that has the audience responding audibly. Beyond these coups of casting, the acting, for the most part, is exceptional. Joshua Jackson brings affecting warmth, wit and strength to James, whose own life has been marked by strife with his parents. Jackson nimbly handles the task of signing to Sarah, working into his own dialogue the translations of what he and Sarah are saying in sign language, and then letting it color his own emotional scoring. It’s a quietly bravura turn without a false moment. Prominent in the supporting cast is Anthony Edwards, of ER television fame making his Broadway debut. As the fuddy-duddy head of the school, Edwards brings an additional dollop of humor to the proceedings, although the character could probably use a bit less fuddy-duddy-ness. Particularly notable are John McGinty as Orin, a firebrand of a student at the school and Sarah’s long-time friend, and Treshelle Edmond as Lydia, yet another student with a girlish crush on James. As with Sarah, Medoff insists that these two roles, in any professional production of the play, be performed by deaf or hearing-impaired actors. Completing the cast is Julee Cerda, as a lawyer somewhat cluelessly taking up the cause of equal employment for the deaf at the school. Leon’s staging moves the action fluidly on the fairly abstract but striking set by Derek McLane, tellingly marked by a series of door frames stunningly lit by Mike Baldassari. The sound design by Jill BC Du Boff and original music composed by Branford Marsalis, along with such soulful pop as Stevie Wonder’s “Love’s in Need of Love Today,” reinforce both the romance and tension of the script. The production also gains credit for the accessibility it provides the hearing-impaired. At every performance supertitles are projected atop the set and closed captioning is available on Apple and Android devices. At certain performances, American Sign Language interpreters will also be on hand. These grand accommodations plus the sterling play itself assure us that the gods of the theater are not among the lesser ones. No closing date announced; currently booking until September 9.